Black Rock was one of the earliest European settlements in America, founded just 10 years after the colony of Jamestown. It was once home to an offshoot of the Shawnee Indian tribe referred to as Lin-nie Meth-ti-quie, or the “Tree Men.” These long-dead Native Americans lived deep in the Neppoa Woods, and jealously protected them from the encroaching white-man until they were massacred in 1616. The early settlers could not understand why the Tree Men fought so hard to keep them out of the woods. Then then killings began. Throughout the winter of 1616, dozens of colonists were found eviscerated and drained of blood. According to the history books, surviving Tree Men were hunting the settlers and offering them as pagan sacrifices until they were stopped by a hunting party led by Jedidiah Curry. The history books are wrong. The Lin-nie Meth-ti-quie had been guardians of the woods, but more importantly they were guardians FROM the woods. Neppoa is a haunted forest, full of unspeakable evil spirits. The Tree Men used secret knowledges to keep the monstrous nightmares at bay, but those dark forces were accidently freed when the white man annihilated them. Jedidiah Curry’s family were members of the ancient Druidic order Llyythewd, and had trained him in their old ways. He alone recognized the threat that the settlers had inadvertently released, and knew how to imprison it again. Curry found a small handful of brave men, and recreated the Llyythewd as a secret society among the lumberjacks. Today there are nearly 2 dozen secret druids amongst Lancaster Lumber. While some members of the Lancaster family are aware of the Llyythewd, many members of the clan are clueless as to their family’s true business in Black Rock. Those who practice the wyrding way see their work in the Neppoa Woods to be a spiritual calling, and a sacred duty. Thanks to their tireless efforts, the town of Black Rock itself is safe, but they are surrounded by an equally tireless evil that lives in the woods. When Jedidiah Curry’s grandson Jack married Vivian Lancaster, he joined one of the wealthiest families in the Virginia colony. That wealth has continued to grow over the last 250 years. The Lancasters tend to be quiet, reserved, hard-working folks and are well-respected in town. Many of the Lancasters have grown up working at remote logging camps, and they are very involved in the day to day work of the family business. While it seems odd to outsiders that the Lancasters continue to reside in the middle of nowhere, despite their great fortune, the locals understand. Black Rock is a nice place to live. The Guthrie family have been rivals of the Lancasters since before America was colonized. Their constant one-upsmanship has resulted in Black Rock’s prosperity. For every dollar that the Lancasters spent in town, the Guthries would spend two. Because of this, the town has always been much more diverse and cosmopolitan than many of its neighbors. Virtually everyone in Black Rock is loosely connected to one family or the other, whether it be by marriage, friendship, or employment. Hostilities between the “Diggers” and the “Cutters” are always simmering, frequently blowing up into a fistfight if alcohol is involved. In rural West Virginia, even during Prohibition, alcohol is almost always involved. Unbeknown to anyone other than the Llyythewd, the Guthrie family are not the philanthropists that they appear to be. Their family is secretly intertwined with a cult called the “Brotherhood of the Twisted Star,” and worship a being thought to slumber deep beneath the hills of Black Rock named Tsluelshf. He is the actual source of all the evil and strangeness that surrounds the town, and was the great evil originally imprisoned by the Lin-nie Meth-ti-quie. The Guthrie family’s mining business is just a front to dig down to their sleeping elder god and awaken him, plunging the world into chaos and death. The millions of dollars that they’ve made in the process is just a bonus. 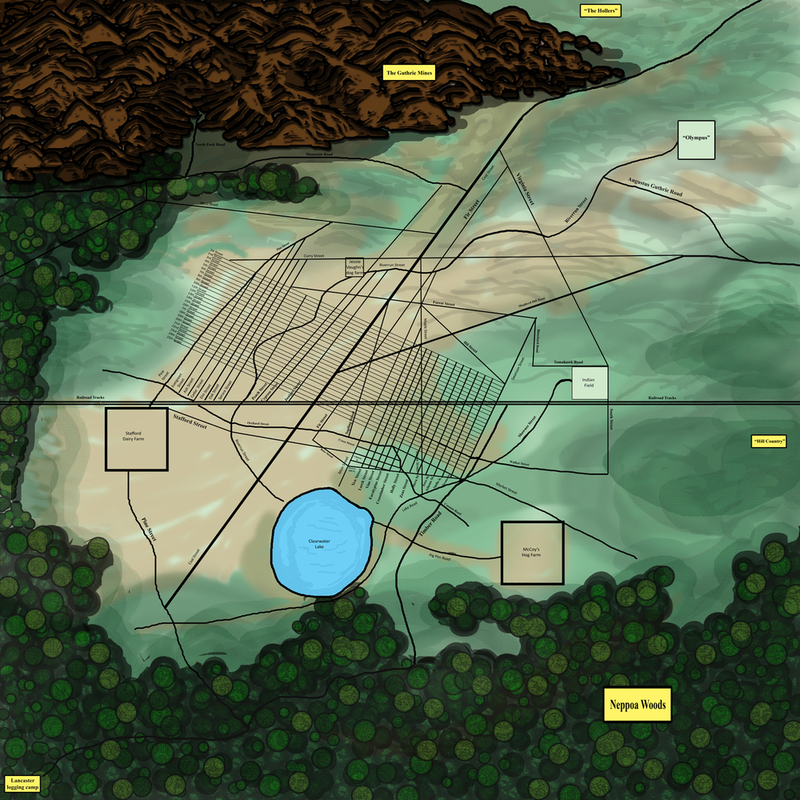 A third faction exists on the outskirts of civilization. The Ferguson clan are Appalachian hill folk, keeping to themselves and shunning city life. The family, as they refer to themselves, are intensely loyal to each other but cannot be trusted by anybody else. They are rumored to be inbred and cannibalistic, but nobody in town is able to completely separate the fact from fiction. What nobody other than the Fergusons know is that they aren’t completely human. The bloodlines of the Ferguson clan stretch back to before the fall of Atlantis in the forgotten nation of Stygia. They are a race of cold-blooded snake men, worshipers of the serpent god Yig. Due to (often forced) cross-breeding, they are able to pass as human, but there’s always something just a little “off” about a Ferguson. Unlike the Lancasters and Guthries, they have no great agenda. The Fergusons are petty criminals and thugs, a chaotic wildcard in the town of Black Rock. 1. The Lighthouse Diner- Nobody really remembers why there’s an old lighthouse in the middle of town. It’s twenty miles to the Ohio River, and nowhere near any truly large bodies of water. Still, the old lighthouse has stood for over 250 years at the corner of 1st and Swanson Street. In early 1901, a midget vaudevillian named “Short Sleeve” Sammy Short moved to town and paid for the abandoned building in cash. With his diminutive yet beautiful daughter Dolly, he converted the space into the best restaurant in town. They open every morning at 5:00 AM with their famous flapjack breakfast and stay open until midnight. Sammy and Dolly live upstairs in the lighthouse, and are always on hand to whip up something good and filling. Every once in a while, old circus and vaudeville friends from Sammy’s traveling days drop by and reminisce about the good old days. 2. The Orpheum Theatre- The Orpheum was originally built in 1899 as a live theatre on the Orpheum circuit, one of dozens of venues across the country that hosted live acts including singers, comedians, dancers, and magicians. A mysterious fire gutted the building in 1917, following a performance by the beloved blackface act “The Harlem Hootenannies.” With interest in vaudeville beginning to wane, the theatre owners made the decision to convert the Orpheum into a moving picture house. The restored theatre opened a year later and quickly became the center of entertainment in Black Rock. The theatre seats 300 guests on the floor and another 125 in the balcony. Dicky Goodman plays the pipe organ in the orchestra pit as an accompaniment to the silent films when he’s not playing at the church. 3. The Firehouse- Two stories tall, with a huge open bay to house the new motorized fire truck. Behind the firehouse is a small stable where the horses for the traditional fire wagon are maintained. 4. Town Hall- Four stories tall and built entirely from locally worked stone, the town hall is the tallest building in town. Atop the building is a massive clock tower, donated to the town by the Anderson family to commemorate the town’s 200th anniversary in 1817. 5. Police Station- Middle-aged Sherriff Clayton Lucas is laid back and easy going, treating his deputies Arnie Rogers and Jeff Campbell like they’re his sons. In fact, the law in Black Rock has always been a family business. The men of the Lucas family have been the town sheriff going back to the founding of Black Rock. It’s a tradition in the town that everyone’s grown accustomed to. Every generation, instead of having an election like in most towns, the eldest Lucas son is sworn in by the Mayor. Clayton might prove to be an exception to the tradition though. His only son left Black Rock as a child to live with distant relatives in Chicago. Rumor has it that he was plagued by nightmares, and needed treatment from a specialist in psycho-analyzing. Nobody knows what will happen when Clayton is ready to retire, but that seems like it’s years off. The station has 2 small holding cells, each one can fit up to 4 occupants. Ezra, the kooky town drunk can often be found sleeping one off. He’s known to have his own key. 6. The Little Red Schoolhouse- All children within miles of Black Rock learn the basics of reading, writing, and arithmetic here from first through eighth grade. Mrs. Parker has taught here for three generations, as her students grown up and raise families of their own. For a sizable percentage of the town, this is the highest level of education they will attain. 7. Chester A. Arthur High School-Built just five years ago, this two story brick building offers higher education for the children of Black Rock and the surrounding towns. Though many old-fashioned townsfolk see no reason for fancy “book learning,” members of both the Lancaster and Guthrie families have gone to great lengths to promote it. 8. Black Rock Telephone & Telegraph Dispatch Company-Few citizens of Black Rock have their own phone, but many businesses share party lines with each other. The Lancaster and Guthrie families have their own direct lines, and the telephone operators frequently connect them on the town’s one long-distance line to calls to far away cities like Atlanta, Charleston, and Philadelphia. 9. Doctor Ed Beacon’s Office-Dr. Beacon married into the Lancaster Lumber fortune, but originally comes from a poor coal mining family. While tensions are always high between the two town factions, Dr. Beacon’s office is one of the few neutral locations in Black Rock. His bedside manner is gruff and even a little argumentative, but he’s a good doctor. Many of Dr. Beacon’s patients are poor, but he’ll let them pay whatever they can, whenever they can. 10. Ralph Watkins, DDS-Nobody likes a dentist, and Dr. Watkins is the reason why. He’s smarmy and disingenuous, seeming to take a certain amount of sadistic pleasure in his work. 11. Earl Simon & Sons Plumbing-Located downtown, at least one of the Simons are on-call 24-7. 12. Frank Lancaster Automotive-Cars are new to Black Rock, but thanks to the Lancaster family they’re becoming more and more common. Not only do they sell new and used automobiles, but they also have a full-time mechanic for repairs. 13. The Landmark Hotel- Built soon after the Civil War in 1866, the Guthrie-family owned, four story hotel used to be the biggest building in town, and is still an impressive structure. The Landmark hotel is much more lavish than a town the size of Black Rock would normally have, but the Guthries needed a luxurious place for their wealthy friends to stay. 14. Founder’s Square Park- In the shade of the Town Hall, Founder’s Square is an open park with a gazebo and picnic tables. Every year on May 1st, the Founder’s Day parade ends here with a brass band concert and fireworks. 15. The Greenwood County Fairgrounds- Just west of town, the Fairgrounds are home to everything from the annual livestock show to hosting traveling circuses. 16. Floyd’s Barbershop- Casual conversation and a high and tight haircut. 17. Derleth Bros. Department Store- Five stories tall and measuring 300,000 SQFT, Derleth Bros. is a massive Art Deco building taking up an entire block downtown. Many old businesses were bought and bulldozed to make room for the new department store, and some resentments linger against the “carpet-bagging” Derleth brothers Anton and Bertram. 18. Maple Street Pharmacy- The local drugstore has the best soda fountain in town and a popular sandwich counter. 19. King’s Tobacco & Candies- Sweets and smokes: treats for the entire family. 20. Madame Blonski’s Tea Room- A popular meeting place for local ladies, Madame Blonski is a spiritualist known to read tea leaves and tarot cards for patrons. 21. The 21st Street Mission-Sponsored by St. Lawrence’s Catholic Church, this soup kitchen and shelter looks after the most disadvantaged citizens of Black Rock. The Mission is open from sunup to sundown, and they enforce a strict no-violence rule. Transients are welcome to stay the night, but they are not allowed to stay two nights in a row. 22. The Shawnee Street home for abandoned youngsters- Times are tough, and children can easily become wards of the state. At the home, they tend to the orphans and abandoned children of West Virginia, providing them with the basics of survival (if little else). 23. U.S. Post Office- Neither rain, nor sleet, nor gloom of night stays these couriers from the swift completion of their appointed rounds. 25. The Old World Bank-Open five days a week, from 7:00 AM-2:00 PM. The Old World Bank has a large vault, and a single guard on duty. The elderly Aurelian “Jake” Smith is a Civil War veteran, who happily snoozes the day away in a rocking chair, “guarding” the bank with his war-time service rifle across his lap. 26. Alistair’s Fine Shoes- Originally specializing in fine footwear before the arrival of Derleth Brothers, they now mostly resole shoes and sell cheap work boots. 27. The Ohio River Athletic Club-Established in 1899, the club has a swimming pool, bowling alley, tennis court, and modern gymnasium for members. 28. The Branford Gentleman’s Club- One of few places where Guthries and Lancasters mix, the Branford has an exclusive membership of only 13 members at any given time. Colonel Greenberry Branford, the grandson of the club’s founder Cyprian Branford, lives at the club year-round. He hasn’t stepped a foot outside this century. 29. Emmett’s Newsstand- Whether you’re looking for the latest big city paper, pulp magazine, or crudely illustrated socialist newsletter, Emmett’s is the place to go. 30. The Fresh Air Market-Famers from all around the county bring their goods here to sell, but the market is best known as the one stop for of all the latest gossip. 31. Sterling Dresses & Finery-Importing fine clothes from their offices in New York City and beyond. 32. AM 740 WKTU Radio Station-Playing a mix of religious standards, popular radio shows like Amos & Andy and the Shadow, and new blues and jazz music that’s taking the world by storm. 33. The Black Rock Daily Tribune-Printing all the news that’s fit to print! Neither the Lancasters nor the Guthries have managed to dominate the Tribune, and they’re proud of their independence. 34. Wally’s Service Station-The only service station in town, just ring the bell for an attendant. 35. Oak Shade Cemetery-A historic cemetery, in use since the original founding of Black Rock. 37. Water Tower-Piped in from Clearwater Lake, providing water for the entire town. 38. Anderson’s Livery Stable-Less in demand since the arrival of the automobile, but still an established institution. 39. Greenley’s Groceries-Built on the location of Greenley’s original General Store, Greenley’s Groceries has everything that a homemaker needs. 40. Hank’s Butcher Shop-Hank’s is known for his friendly service, though he’s rumored to be a little too friendly with many of the married ladies in town. 41. Lancaster Lumber-The downtown offices of the Lancaster family business. 42. Archibald & Sons Piano Company-For three generations, the provider of top of the line, handcrafted musical instruments. 43. The Divine Ballroom-A fancy late night supper club, seemingly out of place in rural West Virginia. 44. Cooke’s Handcrafted Furniture-Quality woodworking, since 1771. Cooke’s is one of the oldest businesses in the state, and is a southern institution. 45. Covington Antiques-Sandwiched between larger buildings, this tiny curiosity shop is paced from floor to ceiling with the old and the odd. When the original proprietor Gernsay Convington left town suddenly Victoria, his niece from back East, took over the business. 46. The Appalachian Steakhouse-The finest dining in all of Black Rock, now serving Waldorf Salads! The Appalachian is a very stiff and stuffy restaurant, way more formal than any other place in town. 47. First Baptist Church-The largest of Black Rock’s churches, its congregation is very active planning social events. Many of the women of the Black Rock Baptist Ladies Temperance League worked tirelessly to ensure the passing of Prohibition Black Rock is a pleasant town, without any real religious strife between its denominations. 48. St. Lawrence’s Catholic Church-The oldest of Black Rock’s churches, St. Lawrence is named for the patron saint of miners, and the Guthries are their major benefactor. 49. Mt. Zion Baptist Church of the Second-Coming-While Black Rock isn’t officially segregated, most of its African American residents live south of the Railroad tracks in the poorer section of town. They have their own businesses and even their own church. Throughout the week, townsfolk from the north side of town crossover into “Black-town” for their delicious barbeque. Nicknamed “The Church of the Second Serving” by white folks, they began cooking as a church fund-raiser and have kept up with it ever since. 51. The Outlaw Nite-Club-This south side jazz club is the most happening night spot in Black Rock. Famous for its risqué dance numbers, live music, and under the table booze, it’s a place where there’s no difference between the black and white customers. 52. Roscoe’s Speakeasy-Hidden down a secluded dirt road, Roscoe’s is an open secret in Black Rock. Though prohibition is technically the law of the land, everyone in town understands that the speakeasy has its place. Even Sheriff Lucas is willing to turn a blind eye to Roscoe’s, so long as there isn’t any violence between the Cutters and the Diggers. Roscoe is friendly and easy-going, so long as everyone understands that he don’t want no trouble in his place. 53. The Old Gibbons Brewery-Shuttered and vacated by the Volstead Act on January 17, 1920, Thye Gibbons Brewery used to make really good beer. Now many of its former employees have their own stills hidden in the surrounding hills. 55. Lancaster Logging Camp-An encampment of temporary buildings used by lumberjacks as a staging ground, so they don’t have to return to Black Rock every night. Cutters might live out in the camp for months at a time before returning home. 56. The Guthrie Mine-The Guthrie family has over a dozen active coal mines in the Black Rock area, employing nearly half of the town in some capacity. 57. Guthrie Coal & Gas-The downtown offices of the Guthrie family business. 58. Cold Ice Delivery-Electricity is a new luxury in Black Rock, and ice delivery is still the best and most affordable way for most of the town to keep things cool and refrigerated. 59. Stafford Dairy Farm-One of Black Rock’s largest farms, the Staffords bottle and home-deliver milk all around town. 60. McCoy’s Hog Farm-The McCoy’s smoke meats and make sausage at their farm, in addition to breeding prize-winning pigs. 61. Jessie Vaughn’s dog-farm-Breeding the best hunting dogs in West Virginia, the specialize in bird dogs like the English and Irish Setter. Jessie doesn’t bother much with people, but gets along great with his dogs. 62. Indian Field-Whether it’s for a baseball game or just flying a kite, there’s no place better to spend a Sunday afternoon. 63. McDevitt & Sons Scrapyard-A junkyard, where you can find just about anything that you need if you look hard enough. Old Man McDevitt has been around for as long as anyone can remember, muttering gibberish from his toothless maw. He’s seen as maybe a little eccentric, but harmless. 64. Clearwater Lake-Popular as a fishing hole for children and a scenic location for romantic getaways among teens, Clearwater Lake is always hopping. A ridge overlooks the lake that’s perfect for “parking” with that special somebody. The anime series Sūpāchīmu eto batoru (スーパーチーム干支バトル)AKA Super Team Zodiac Battle, debuted in Japan in 1979 and was edited and translated for American audiences in 1982. Re-released by infamous American television producer Sandy Frank under the name Super-Star Ship Odyssey 5, the revised version of the show removed most of the overt sexual content and violence that had initially made it popular with viewers. The series was known for its psychedelic opening credits sequence, set to rock & roll Theremin music and a strong pro-equal rights message. In 1999 Adult Swim began airing the original cut of Super Team Zodiac Battle as part of its “Midnight Run” block of shows including Sailor Moon, Outlaw Star, and Gundam Wing. This introduced the show to an entire new generation of fans, but created a schism between them and the audience who grew up on the more sanitized version from the 1980’s. New merchandise was released to stores like Hot Topic, while the original action figures became sought-after collectibles. A computer animated remake was originally planned for 2004, but was delayed for several years due to rights issues for the show’s many songs. In late 2014, a new digitally remastered version of the complete series was released, and the long-rumored live-action update has been officially announced for the summer of 2017 from Disney. · Robots, or “Clangers” as they were derogatorily referred to by American soldiers, were used by the Russians as mindless shock troops during World War III. · A massive spherical star-ship crashed into the Pacific Ocean on the Big Island of Hawaii on July 25th, 1989. Aboard the ship was a mortally wounded scientist named Yorba who warned that hostile forces were on their way to conquer the Earth. The sudden proof of Alien life and the subsequent fear of invasion brought about the immediate end of World War III. · Radiation from the Starship Odyssey’s massive engines caused some odd mutations among Hawaiian wild-life, giving many indigenous animals the ability to speak. The military stopped the radiation leak, and seized the affected animals for study. In the ensuing decade, many of those animals have been used for military purposes. · After the Treaty of Kyoto officially ended hostilities in 1989, the use of robots in warfare was strictly outlawed by the United Nations. Their advanced technology was adapted to serve man. · Every year the Tesla Corporation releases two new Androids for personal and home use, a man and a woman. These lifelike automatons are programmed with an obsolescence protocol that causes them to shut down a year later, when the new models hits the markets. This is thought to prevent them from developing a fully aware sentience. · Countless other non-human looking Robots are available for purchase. They tend to work in industrial settings, while the human-like Androids interact more directly with people. · Due to advances in technology, the Tesla Corporation manages to keep the cost of Androids and Robots down low enough that virtually any citizen can afford to buy them. · The town of Yorba has quickly spread around the Star-Ship crash site, known locally as the Crater. It is a thriving community that exists to support the countless soldiers and scientists who have spent the past decade studying the crashed ship and reverse-engineering the alien technology. · Alien technology found aboard the Starship Odyssey is discovered to be psychoactive, controlled by a neural-link with its user. Scientists from the Global Defense League begin to reverse-engineer this found science. · A tiny fraction of humanity is born able to psychically interact with the alien technology. Actives, as the United Nations of Earth refer to them, are in desperate short supply and are recruited at any and all costs. · Many of the world’s old capitols were destroyed during World War III. The United Nations of Earth are a new single world government, based out of Rio de Janeiro near the Earth’s equator. They are heavily militarized, and obsessed with preparing the world for the impending alien threat. Their army, the Global Defense League, has access to advanced alien technology that they have reverse-engineered. · The crown jewel of the reverse-engineered technology are the Celestial Knights, Actives are inserted into a cylinder of living liquid metal that then reshapes itself into a Mecha based on the Active’s Astrological sign. They become bonded to the new vehicle, able to pilot and command it in ways that seem impossible to Earth science. The Mecha can even combine with four others into a gestalt entity called a Titan. It is though that the Celestial Knights will be Earth’s last line of defense when the alien menace arrives.